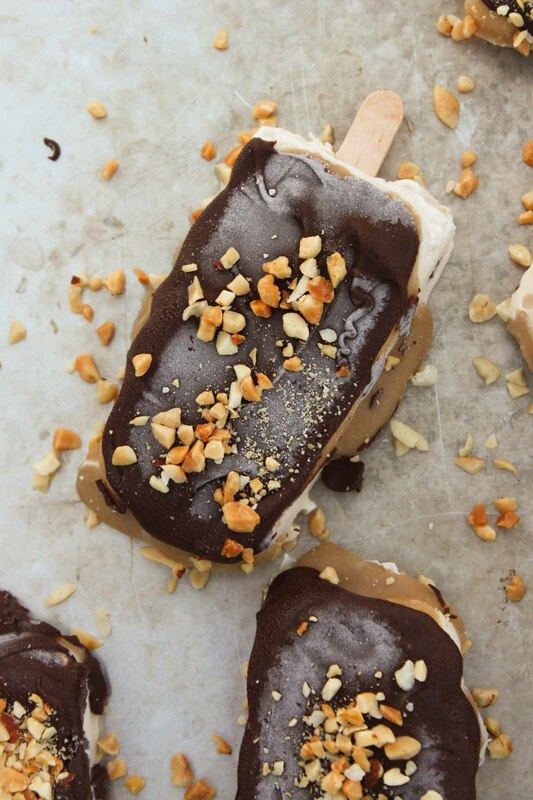 This is pretty much snickers in an ice cream bar form or as we call them healthy snickers ice cream bars. Also known as the best of both worlds. Not to mention the fact that it is on the healthier side of the spectrum… well the healthier side of the unhealthy side. Let’s just say it isn’t as bad as a snickers bar and call it good, mkay. But in all honesty there is nothing better than homemade ice cream, stuffed into molds, removed and dipped in stringy homemade caramel with a chocolate shell. My kids would tell you that it was missing sprinkles, because life is made up of sprinkles to them. Always a party when you are two and four apparently. This was our fathers day gift because food is love around here. Not that I promote using food as emotions but sitting around the table living life together and loving on one another is one of the best ways this family stays connected. It is especially special when mom (aka me) whips out the ice cream maker and we go to town. You know what my girls say about ice cream thanks to their dad, it just fills the cracks. So we sent out on a special adventure to make this with only a few minor mishaps along the way including spilling my $10 bottle of pure vanilla, again. Weeping inside I told her it was okay and that mistakes happen. Inside I was thinking $10 more dollars are on her clothes, ahhhh. But that is life with kids, sometimes you feel like you should just roll down the windows in the car and throw money out as you drive. But this is life and this is why we celebrated Father’s day knowing that this is life. Life with kids is full of surprises, of spills, of moments where you feel like you are losing it (okay a lot of these moments), full of laughter, whining, crying and sleepless nights. Every moment is worth it when at the end of the day they wrap their little arms around you just to be close to you. Sitting down at the end of the day around the table (well most of us around the table others of us are either on or under the table because a two year old sitting in a chair is a rare moment) is mostly hectic but heart warming none-the-less. 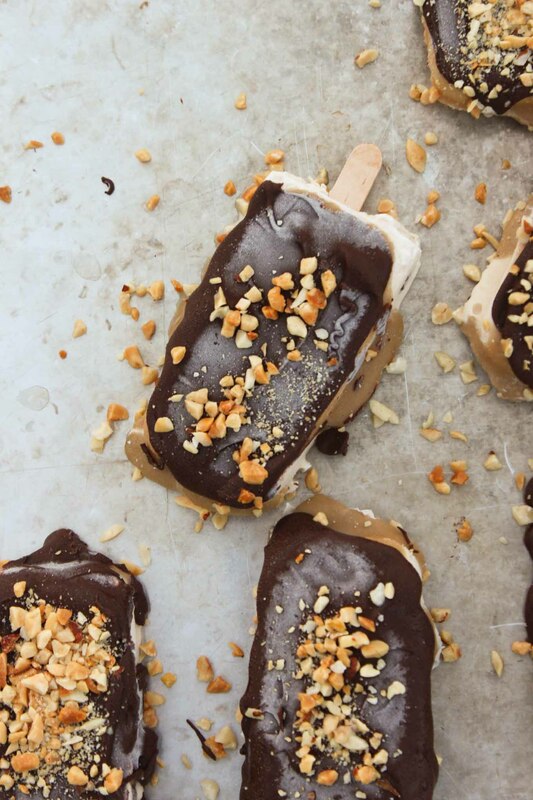 So after making these healthy snickers ice cream bars the previous day and listening to pleading and begging to eat them nearly every five minutes for 12 hours straight I gave in and we ate these a few days early. Which was fine and great until my four year old became flustered that we had celebrated Father’s day before Fathers day and after a million and one questions of her trying to figure out this madness she sighs and says, “this is just so confusing.” as she proceeds to throw her head back against the car seat. This is life, it doesn’t always make sense but you just go with it because that is the only thing that keeps you a float and enjoying this thing called parenthood. One thing I do know is that life lessons are always easier to swallow when a healthy snickers ice cream bar is involved. I mean it kind of takes all worries and cares away for a four year old. Who by the way would like you to know that she is almost five (her birthday isn’t until October). 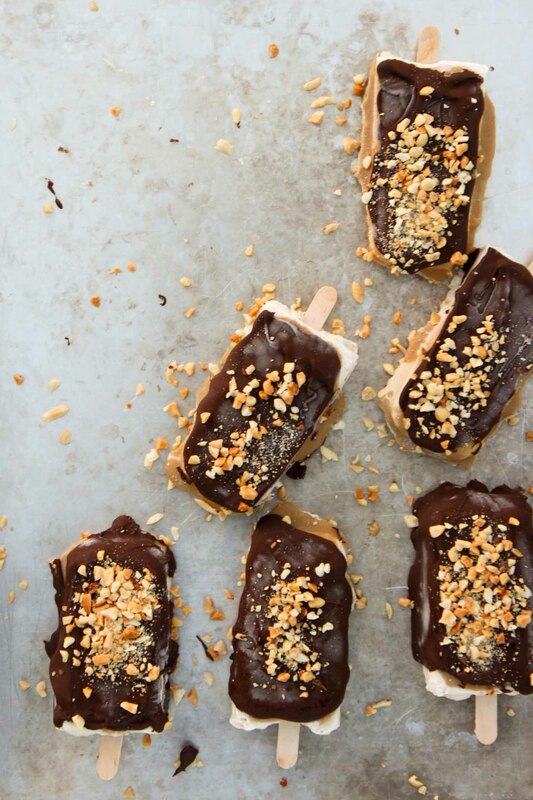 Creamy, sweet vanilla ice cream bars, dipped in thick caramel sauce, and coated with a chocolate shell all sprinkled with those delicious roasted chopped peanuts. Perfection. Place ice cream tube in freezer overnight (if using an ice cream maker). Place coconut milk, vanilla and coconut sugar in a saucepan and heat until all ingredients are mixed through. 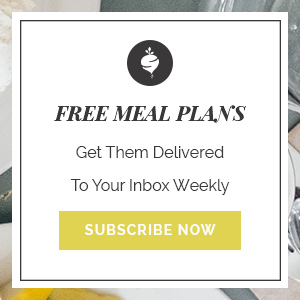 Pour in a glass container and refrigerate for 2-24 hours or until cold. Add to ice cream maker and mix. 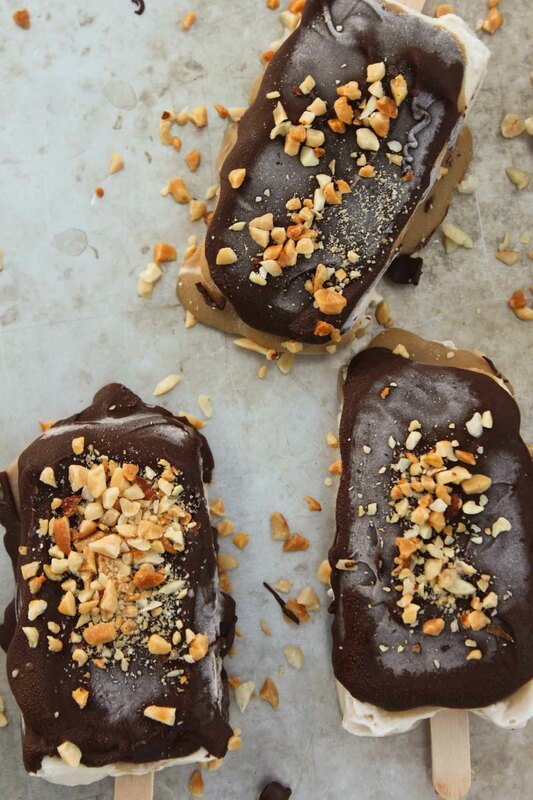 Place ice cream in molds (should make 8 ice cream bars) and freeze for at least four hours. 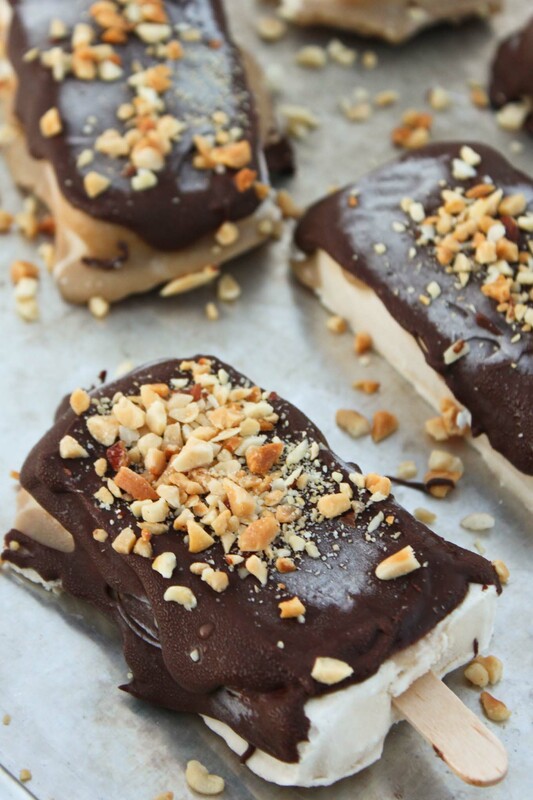 Remove ice cream bars from mold and dip or smear with caramel sauce (I did one side). Freeze on a parchment paper lined pan. Make caramel sauce and let cool to room temperature. Once bars are frozen, make chocolate shell using a double boiler. Add chocolate chips and coconut oil mixing until fully melted. 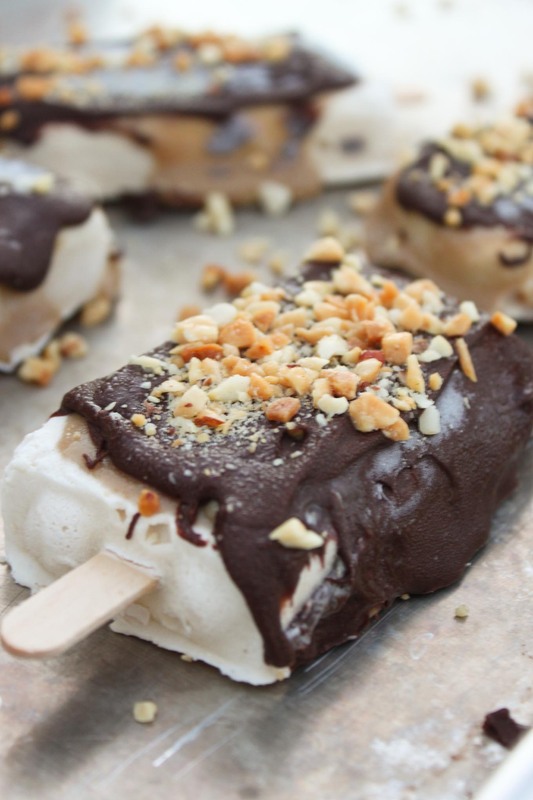 Dip ice cream bars coated in caramel in chocolate shell and sprinkle with nuts immediately. Return to parchment paper lined pan and freeze again.